An attorney by training, Michelle D. Bernard is a political and social justice journalist, pundit and opinion maker, social critic, author, columnist, and public speaker. Neither Democrat nor Republican, Ms. Bernard is fiercely independent in her political views and is particularly interested in how national and local politics, policy, and elections affect matters of racial, social and gender justice, the economy, the digital divide, national security, terrorism and the military, and the advancement of democracy, economic liberty, and the human rights of women and ethnic and religious minorities globally. As the president & CEO of the Bernard Center for Women, Politics & Public Policy, she concentrates on domestic and foreign policy matters and provides commentary on topics as varied as presidential politics, the 2016 presidential election, various Congressional and gubernatorial campaigns and elections; the political participation and voting trends of African Americans, Latino’s, women and millennials, education reform and school choice, foreign policy and national security issues, and advancing democracy, economic liberty, and international human rights. Additionally, an outspoken advocate of the human rights of people of color, women, and religious minorities globally, Ms. Bernard is, among other things, a passionate advocate of the significance of the Black Lives Matter movement and the #SayHerName campaign of the African American Policy Forum. An ardent advocate of women’s human rights, Ms. Bernard has assisted in the development and implementation of training programs built on the pillars of democracy, women’s rights and religious freedom, political activism in a democracy, issues of governance, free markets, and non-governmental organizations. In March 2016, Mrs. Bernard was awarded a distinguished alumni achievement award from Howard University for outstanding post-graduate achievement in the fields of media, journalism and public policy. In 2015, she was awarded the Anvil of Freedom Award for journalism and democracy by the University of Denver’s Edward W. and Charlotte A. Estlow International Center for Journalism and New Media. Later that year, the Carrie Chapman Catt Center for Women and Politics at Iowa State University announced that Ms. Bernard was being honored on the University’s Plaza of Heroines. Also, later that year, Upscale magazine named Ms. Bernard as one of “25 Power Players … who have defied traditions, the odds, and more to get where they are today – at the tops of their games.” Ms. Bernard was named in the November 2014 issue of Essence magazine as a “Rising Star” on its annual “Money & Power List.” Additionally, Ms. Bernard has been featured in several publications, including Essence.com, Fast Company magazine, Jamaque magazine, The Legal Times, The Nation, The New York Daily News, The Washington Business Journal, The Washington City Paper, The Washington Lawyer, The Washington Post, The Washington Post Sunday Magazine, and The Washington Times. Report, The 74, The Hill, The Huffington Post, The Root, and The Washington Post’s She The People. Martin. Additionally, in 2008, she joined The McLaughlin Group as a rotating panelist and appeared on that program until the program ended. In 2009, Ms. Bernard co-created and hosted MSNBC’s education reform television special, About Our Children. 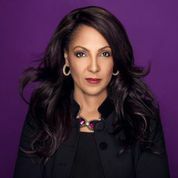 Ms. Bernard is a member of the International Women’s Forum of Washington, D.C. and served as its Leadership Foundation Liaison from 2013 to 2015. She is a former member of the Board of Trustees of Hampton University and the Board of Directors of the Coalition for Opportunity in Education. Prior to founding the Bernard Center, among other things, Ms. Bernard was once a partner at the District of Columbia’s then Patton Boggs, LLP. Ms. Bernard holds a Bachelor of Arts degree in philosophy and political science from Howard University and a Juris Doctor degree from The Georgetown University Law Center. The Huffington Post: The All-Woman Jury Finds George Zimmerman Not Guilty: Will There Ever Be Justice for Young Men? Is Donald Trump Advised by Conservative News Pundits? Did Donald Trump Jr. Violate Federal Law through Russian Lawyer Meeting? Trump LawyerJay Sekulow: Distancing President Trump from Don Jr.? “Bluexit” Should Blue States Secede from Red States? Hardball with Chris Matthews: America: Land of the fearful? Minnesota Public Radio: Do Women Senators Govern Better than Men? Video School Choice: Education Equality Now!